On behalf of UpBeat NYC participants, parents and staff, I would like to thank you and your organization, Friends of Brook Park, for hosting our Summer Session Concert. The event brought more than 100 community residents to celebrate the musical achievements of UpBeat’s summer session participants. The value of partnering with Friends of Brook Park to create events like this in the heart of our community cannot be overstated. There is no other place in our neighborhood providing access to the type of safe and beautiful outdoor gathering space that Friends of Brook Park provides. More importantly, the positive and welcoming environment created by you and your staff perfectly complements and enhances UpBeat’s goal of building a strong community of families and friends to support the well being of Mott Haven children. Our families were thrilled to have the event hosted at the park, and we very much look forward to partnering with you to create another event very soon! Our community is lucky to have Brook Park. Since moving into our campus , our students have had several memorable experiences due to the activities and excellent contributing members. We are the Brilliant Bucks of M.S. 224 and we are entrepreneurs.We are very excited to have an opportunity to use the Brook Garden because it grows vegetables and fruits and healthy foods that are great for our community. It allows us to learn how to plant and grow our own foods and to learn more about nutrition and how it relates to business. Our community is lucky to have Brook Park. Since moving into our campus in 2008, our students have had several memorable experiences due to the activities and excellent contributing members. The opportunity to be on the secluded waterways which cut through the internal landscape of NYC is rare and beautiful. The water, the river, is sacred, full of wild life most new yorkers are unaware they share the island with. Also, the act of canoeing automatically creates an atmosphere of team work and camaraderie for all involved from child to adult. This simple act bonds all who share the experience, as if they shared a smiling secret. have to do to keep our planet healthy and clean. under all the construction that there is right now. decomposing. Moving concrete around and tasting sugar from a leaf. have an experience with places like Brook Park. Our kids appreciate the fact that this marvelous space was transformed from a vacant junk yard into the marvel that it is today. They love to do the grown-up work they are entrusted to do: chopping wood, digging with shovels, moving wheel barrows of soil, etc. They love to explore their surroundings – discover interesting rocks and find worms in the soil. They embrace what they do at Brook Park with every fiber of their beings, because they know that what they are doing there is important – that they are really improving the community and because they are having fun! They get encouragement from Harry, the director, to totally engage with nature in a way they probably never have before: to climb trees, eat the cherries, taste the collard greens and more. On our latest trip, our 4th graders met their pen pals from a public school in the Bronx for the first time. The garden served as wonderful catalyst for interpersonal exchange, crossing over ethnic and socioeconomic borders through the shared experience of discovery and cooperation that is innate to Brook Park. In closing, we would LOVE to see a live brook restored to Brook Park! I can’t think of a more worthy recipient for funding for this endeavor. Last year, our 4th graders had the cathartic experience of literally breaking up the urban asphalt as the first step in the process of uncovering the brook. We will be delighted to see the native water resurface! Yesterday I had a lot of fun I got to hang out with my friends. Also the plants were really interesting and the vegetables growing were also really good to eat. By doing what you do, you and your team are saving the community and a lot of animals. The tomatoes and the spicy peppers were very good. Also the scented plants smelled really good. It was very interesting because I never thought that plants that don’t have flowers have a nice smell, like the leaves that I ate which was peppermint plant. I also liked the little fire you made for us and all the people that were going in the park. I had so much fun moving the heavy logs around and fixing them so the garden could look prettier. The garden made me feel really relaxed. anybody with the slightest interest in the outdoors. opportunity to do as their ancestors, did and work with the great outdoors. game of baseball. Just in case you think Brook Park is all work and no play. the word can spread, and Brook Park becomes known. canoe was interesting because there is a certain way that you have to it. and a barbershop to the right of it, is something you don¹t see everyday. But I get to see it every Monday. health, I understand the importance of outdoor play and exposure tom nature. to create a border, building low walls of stone and collecting firewood. to help us preserve the earth. Please support this project. Thank you. Today I participated in a project at Brook Garden located in the South Bronx. is an organization that can greatly improve the city. 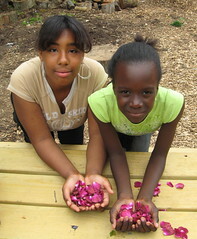 Today I volunteered my time at Brook Park/ gardens in the Bronx with a few high school students. This summer we are going to Mali and Nicaragua to build school houses and this was a first experience of the actual events that we will partake in. However, today my labor has inspired me to make local citizens aware of the situation in this park, and many others in New York City. The day began when I first arrived at the garden. It was interesting to see so much green in an area of dull colors and conformity. I proceeded to move heavy logs with my fellow peers. We also raked and spread cedar seeds throughout the garden. The improvements were noticeable at once. My peers and I had an exciting time. The day ended with our group traveling through a labyrinth in which we also contemplated the activities of the day, and the impact our work will have on the community. I learned that the beautiful gardens with herbs, vegetables, trees and flowers had been a dirty empty lot only seven years before. The transformation was unbelievable. I know that it will help me throughout my life. I wish that people would continue to support this cause because many people are willing to donate their time and energy into projects such as these, but a financial foundation is necessary as well. changing and become better and better. could be greatly affected if there were more tools like wheel barrels. Difficult activities would become easier. Working at the garden, you notice many people watching you. People are amazed at how great it looks. While taking out the garbage, I talked to a woman from the neighborhood. She had great things to say about the garden, and memories of it as a vacant lot. Talking with hermade me realize what a difference we are making. I believe that Brook Garden will make a difference in the world. Thank You Friends of Brook Park for an extraordinary learning experience for my 8th grade class from MS 331. For our culminating end of the year project we addressed “How can a small group make change in the world?” Year long we looked at individuals in our lives and communities and through out history that have dedicated their lives to social change. Bringing students to Brook Park, where individuals are making a difference to create community gardens and preserve indigenous heritage we had the rare opportunity to be a part of that experience right in our own back yard of the Bronx. Our class came together as a group to put up the park’s tipi. It was a special experience to see students support each other and work together as we chopped wood, and organized to put up the tipi. In the unique outdoor experience that our classroom became, students that often have social and behavioral challenges were able to take time to themselves and reflect quietly next to a tree. The next day I noticed a shift in certain students attitudes and I directly related this to our team building experience at Brook Park. Thank you to the staff for your talent in leading and communicating harmony and team practices with young people. My class truly learned a lot from you and respected the process and really enjoyed the outcome that came from our time At Brook Park. I look forward to continually bringing my class for more educational experiences through Friends of Brook Park.